They both have hybrid powertrains and the same basic shape, but don't think of the Insight as Honda's answer to the Toyota Prius. The Insight is smaller, simpler and not as efficient, but it's also significantly more affordable -- the most affordable hybrid you can buy, in fact -- starting at around $19,000 and topping out with a navigation system around $24,500. Best city warrior to get around the city. Our car is super gas efficient and drives well. We live in the city where there’s lots of stop and go so the gas efficiency is really important to us. It is super dependable, we have driven it through snow and rain without any problems. The comfort is fine for short distances but we've gone on several road trips and once you get at about the three hour mark it is not so comfortable. We do love that it is so compact that it is always easy to parallel park in the city but super spacious inside. We have been able to run to the local hardware store to bring everything from huge bags of soil to bricks. Having the rear passenger seats fold down easily with the push of a button is super helpful when we have large items. We have had about 3-4 recalls though since we bought it in 2012. The most recent was about a month ago, makes me wonder why it took six years to find out that there is something wrong with the airbags. Honda insight works best for me. I love the economic Honda insight. 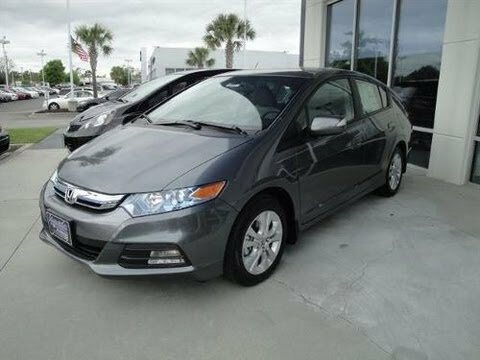 I reviewed several cars before I purchased and decided on a hybrid insight because I wanted a hatchback 4 door small car and the Honda insight fit the bill. The reputation of Honda also led me to look at the insight. I drove both the insight and the Toyota Prius but the visibility for me in the Prius was severely limited and it was not in the insight. I also drove the Nissan leaf and felt it do had limited driver visibility. I am short and I could not adjust the seats of the Prius or the leaf to be about to see out the back window of the car enough to feel safe driving it. The gas mileage! It's amazing! The backup camera is also great to have! I love it! I've had it for over a year so far and the gas mileage is amazing. I think the only thing I would change/want differently would be that it is lower to the ground and sometimes when I am driving my grandparents it's harder for them to get in and out of the car! Otherwise I LOVE it!